"Over the duration of the weekend there will be live Spanish music, wine tasting workshops and wine walks from experts Olly Smith and Susy Atkins, plus the brand new Rioja and Foods from Spain Tapas Theatre! Learn more about the heritage of the Rioja region with a series of in-depth and informative food and wine masterclasses in this brand new tent. 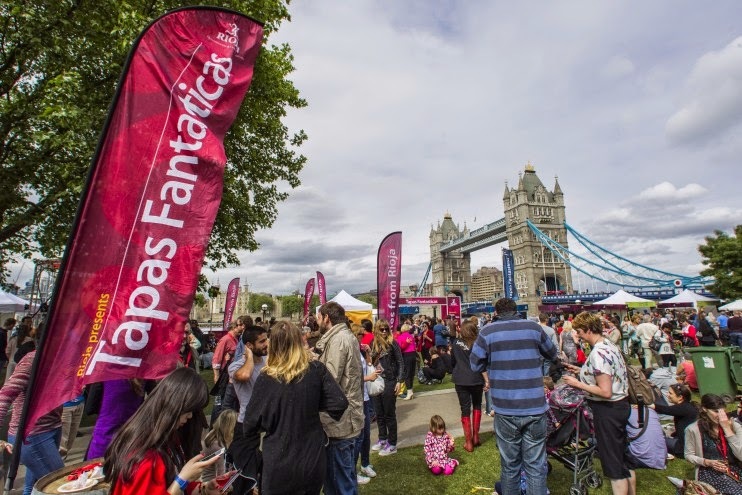 The Rioja and Foods From Spain Tapas Theatre will bring an exciting interactive dining experience to Tapas Fantasticas. Join an outstanding line-up of Spanish food experts and chefs as they guide you through the best of Spanish cooking and produce – all paired with Rioja wines. Sessions last 45 minutes and include tasters of tapas and wine. Head over to the theatre to book your place. Masterclasses, including two tasters of tapas and Rioja wines, cost £10 per person and have limited space. Please check at the Rioja and Foods from Spain Tapas Theatre desk for availability." My Spanish friends are coming and i am thinking to take them there, with this warm and sunny weather is like being at home but with better views! !